As Spain prepares to mark the anniversary of Franco’s death, what is behind its latest upsurge in nationalism? November 20 is a grim day in Spain. It marks the death of Falange founder José Antonio Primo de Rivera during the onset of the 1936–‘39 civil war and also the passing of General Franco after three and a half decades of repression that left more than 150,000 dead. Anarchist leader Buenaventura Durruti died on the same date, but it is the fascist leaders who are memorialized with a yearly pilgrimage to the Valley of the Fallen, where Franco and Primo de Rivera remain buried under the world’s tallest memorial cross. This year is likely to witness an especially virulent 20-N. In the context of Catalonia’s bid for independence, nationalist fervor is on the rise. Spanish flags flutter from countless windows in cities and villages across the country. It would be wrong to think that extremists lurk behind each one—the creases of many rojigualdas in Madrid indicate how recently the flags were purchased. Most were hung in response to Barcelona’s longer tradition of adorning its balconies with esteladas. Nevertheless, the widespread increase in anti-Catalan feeling, coupled with the government’s autocratic mishandling of the crisis, has led observers to link the crisis to Spain’s darkest days. The ghost of Franco haunts Catalonia. While it is tempting to read ongoing events as an authoritarian lapse, this interpretation remains incomplete. More than a simple throwback to Spain’s past, the Catalan crisis presents an ominous vision for the future: one in which the reconfiguration of the state takes place along reactionary and punitive lines. Spanish nationalism has become a vehicle for this endeavor, galvanizing the right and presenting a critical challenge for left and progressive forces. But it is, by its nature, incapable of producing a stable political outcome. As long as symbols of national unity remain cudgels in the hands of the Spanish right, disarray will persist. Spain today is not the same country it was five decades ago. The profound flaws and contradictions of its constitutional monarchy are more similar to those of other European democracies than to the brutality of the dictatorship. Because of this, establishment commentators have lashed out against observers associating the country’s present juncture to its authoritarian past. Examining the crisis through the lens of Francoism can, however, shed light on the government’s course of action in recent months. Maurice Duverger once remarked that just as people are conditioned by their childhoods, political parties are defined by their origins. Prime Minister Mariano Rajoy’s Partido Popular (PP), which governs with support from the center-right Ciudadanos (C’s), owes its existence to Franco’s longtime information minister, Manuel Fraga. In the late sixties Fraga realized the regime could not outlive Franco, so he pressed its modernizing cadres to accept a democratic transition after the dictator’s death. With the dictatorship’s structures still in place and the left too weak to topple them, elites from both sides negotiated a restoration of democracy, with the regime insiders managing to maintain the initiative throughout the process. Established opinion hailed it as a paradigmatic success. But la transición, as it is known, was left unfinished. Spain’s democracy, in contrast to much of postwar Europe, was not erected upon an anti-fascist consensus. Instead, its foundation required a pact of silence. In exchange for returning to democracy, Francoist elites kept positions of social and economic privilege; the dictatorship’s crimes went unpunished as a blanket of amnesty and amnesia extended over the civil war and the systematic repression that followed it. After the 1982 Socialist (PSOE) landslide victory, Fraga and his followers consolidated as the leading opposition party. As a result, the PP became a peculiar conservative party. Unlike their French, German or even British counterparts, Spanish conservatives have never had to worry about electoral competition on their right flank. The party contains everything from center-right liberals and Christian democrats to far-right nostalgics for Franco’s dictatorship. In 2007 parliament passed a law for historical memory which made it easier to find civil war graves, remove Francoist statues and open up archives. It was a long time coming—Spain remains second only to Cambodia in number of unearthed mass graves, according to Amnesty International. But the PP fought hard against it, arguing that remembrance of the dictatorship’s crimes unnecessarily divided the country. A minority of PP leaders have gone further, providing explicit support for Francoism. Unsurprisingly, these authoritarian legacies condition the party’s approach to the Catalan question. As Juan Linz wrote in the 1970s, Spain is “a nation-state for a large part of the population, and a state but not a nation for important minorities.” Under Franco this complex reality was repressed through a brutal, centralizing drive. While the PP had come to view regional autonomy as a fait accompli, its disposition toward Catalonia has been one of hostility punctured by spells of collaboration with the region’s rightwing nationalists. In 2006, when the Zapatero government (PSOE) negotiated a Catalan statute in response to demands for increased self-government, the PP opposed it tooth-and-nail, gathering signatures across the rest of Spain. The highly politicized Constitutional Court eventually curtailed its provisions—a move that lies at the origin of the current crisis. Predictably, the PP has virtually disappeared in Catalonia, where it now represents only 8.5% of voters. Rajoy uses his party’s unpopularity in the region as a recruiting tool across the rest of the country, and has turned the Catalan standoff into a weapon against the Spanish left. Faced with the ongoing crisis, the PP has lost what little restraints it placed on its chauvinism. In recent months, dismissal of Catalan demands has given way to a palpable glee in punishing the region. The decision to depose the Catalan government (Generalitat) was immediately followed by threats to do the same in Navarra and the Basque Country—both run by regional nationalists—and Castilla-La Mancha, where Podemos recently joined the PSOE in a governing coalition. The finance minister’s takeover of the Generalitat’s financing has been followed by a similar move in Madrid, governed by Podemos-backed Manuela Carmena. The “Spanish exception” to the rising tide of xenophobia in Europe, therefore, only begins to make sense when one takes into account that the PP represents a sizable number of hard-right voters. More importantly, the kind of xenophobia that in other European countries articulates along a native–foreign “other” axis in Spain is harnessed along center–periphery lines—a reflection of what Eric Hobsbawm called the “anomalous and self-contained” nature of the country. Anti-immigrant rhetoric is not a leading plank of the PP’s platform—but it is not a coincidence that its most xenophobic politicians often come from Catalonia and the Basque Country, where they would otherwise have very little to offer right-wing voters. Indeed Badalona, the only large Catalan municipality recently governed by the PP (in 2011–‘15), became ground zero for a Le Pen-style experiment under the mayorship of Xavier García-Albiol, now the leader of the PP in Catalonia. Xenophobia lurks not far beneath the surface, ready to be weaponized if more traditional demagogy fails. But it would be a mistake to lay the blame for the ongoing crackdown in Catalonia narrowly at the door of Francoism. If that were the guiding light, it would struggle to command the kind of widespread popular support across Spain that we see today. Spanish nationalism has ideological roots that run much deeper into history. While Franco and Fraga are occasional sources of inspiration for contemporary Spanish conservatism, the place of honor belongs to Antonio Cánovas del Castillo. A Burkean conservative, in the late 19th century he set out to restore the Bourbon dynasty and liquidate the First Spanish Republic, which had ended with the dissolution of the state into autonomous cantons and independent regions. While more democratic than this 19th century predecessor, Spain’s present parliamentary system remained for some time a factory for political apathy. In the aftermath of the recent financial crisis, this state of affairs has been repeatedly challenged. The indignados in 2011, Podemos’ surge in 2014–’15, and the Catalan independence movement have ridden the wave of mass popular engagement. The forces in favor of a repressive solution to the ongoing crisis are drawing on an idiosyncratic nationalism. It cannot mobilize the polis absent an internal enemy that threatens the structure of the state. But, for the purposes of elections, it remains highly useful. As journalist Enric Juliana points out, adopting a hard line on the Catalan crisis has endowed the Rajoy government with a stronger raison d’être than its claim to preside over economic recovery in a country where many struggle with joblessness and austerity. The “Catalan challenge” allows the PP to justify its hold on power and deflect attention from systemic corruption scandals—in which Rajoy himself is deeply entangled. If the PP alone was deploying this strategy it could probably be contained. Unfortunately, it enjoys the open support of the entire Spanish state. The security services have shown themselves eager to break the law in order to enforce it—spreading false information about Podemos and pro-independence leaders, attempting to search the leftist CUP’s headquarters without a warrant, injuring citizens with rubber bullets banned by Catalan law, and beating peaceful protesters while off duty. The courts, meanwhile, have sustained—and occasionally surpassed—the government’s repression, providing it with a fig leaf of legality. And in a notable display of partisanship, King Felipe explicitly endorsed the PP’s approach and refrained from making calls for both sides to solve the crisis through dialogue. The PP has also managed to draw both C’s and the PSOE into its orbit. In the case of C’s little prodding was necessary—the party is attempting to outflank the government from the right by adopting a harder stance against Catalan nationalism. This position might seem at odds with the party’s branding as a friendlier, centrist version of the PP, but it should come as no surprise to those familiar with its leadership. C’s originates from Barcelona, where it was founded twelve years ago as a center-left party opposed to Catalan nationalism. Led by Albert Rivera, a young and charismatic former banker, it was catapulted onto the national stage in 2015. Following Podemos’ success, it positioned itself as a “safer” alternative to established politics. Like Emmanuel Macron in France, Rivera repeatedly defines himself as “neither left nor right.” Ideological vagueness has long been a part of the party’s approach: during the 2009 European elections it ditched its pro-EU platitudes and progressive credentials to join a Eurosceptic right-wing coalition. Throughout 2015, the party’s combination of market-friendly proposals, anti-corruption measures, and relatively-open social agenda made it seem a modern addition to the Spanish right. C’s opposition to the independence movement also seemed legitimated by its position as a Catalan party that, since September of that year, led the opposition to the regional government. Following its support for Rajoy in mid-2016, the party has gradually become indistinguishable from the PP. In line with the hapless tradition of Spanish liberalism in the 20th century, C’s attempts to become the sensible party of the right have been short-lived. In many respects C’s position resembles the PP’s opposition to the Zapatero government. Known as crispación (“strain” or “tension”), the PP’s strategy was based on an acknowledgement that Spain’s electorate is mostly center to center-left, and libertarian or right-wing themes rarely mobilize it. Accordingly, it clashed with the PSOE on questions that do not immediately fall along the left–right axis, such as the centralization–federalization debate or the fight against Basque terrorism. Rivera has sought to recreate this atmosphere by equating Catalan nationalists and Basque terrorists or comparing the Catalan government to the fascists behind the failed 1981 coup d’état. Unsurprisingly, he found an ally in José María Aznar, the PP’s hardline former prime minister, who remains frustrated with what he views as Rajoy’s insufficient belligerence. The resurgence of Spanish nationalism has placed the left in a precarious position. With symbols of national unity monopolized by the right, the space to discuss patriotism from a progressive perspective has diminished. The PSOE’s position is in line with its congenital moderation and its historical failure to find a different way of discussing the nation. Its main effort, in the 1990s, consisted of promoting Jürgen Habermas’ constitutional patriotism. This attempt to ground sentimental attachment in the contents of a—largely unread—document unsurprisingly flopped. While neglecting the fact that patriotism is a fundamentally affective phenomenon, the PSOE also failed to grasp that the 1978 Constitution was a floating signifier, with different meanings to different audiences. By contrast, the PP—which did not even fully support the Constitution in 1978—has exploited this paradox with great skill, wielding “rule of law” as a club in the criminalization of the Catalan independence movement. Lacking a compelling narrative of its own, the PSOE has again ended up following the PP’s lead. Pedro Sánchez, who six months ago won the party’s primaries with bold campaign promises to oppose Rajoy and recognize Spain as a plurinational country, is now engaged in an clumsy U-turn. In exchange for his support, Sánchez has secured the government’s commitment to constitutional reform aimed at placating Catalan nationalists—or, should this prove impossible, securing their marginalization by legal means. This development puts Podemos between a rock and a hard place. The party has, since its inception, defended a constituent process aimed at far-reaching reform of the country’s political and institutional architecture. It is therefore in an awkward position when it comes to flatly rejecting the initiative, even when it has reason to view it as a poisoned chalice. To make matters worse, PSOE support for the reform adds a veneer of respectability to an otherwise reactionary project. Unlike the PSOE, Podemos has attempted to wrestle with the PP’s hold on the symbols of Spanish nationhood, attempting to reclaim patriotism from those who “wave Spanish flags but hide their money in Swiss bank accounts.” Following December 2015’s election, Podemos leader Pablo Iglesias rejected a patria represented by “rancor or vengeance,” evoking instead the idea that “everyday acts” made a homeland. “Never again,” he said, “a Spain without its peoples [pueblos] or its ordinary people [gentes].” Such rhetoric, grounded in the party’s left populist origins, stands in stark contrast to the discourse of Spanish leftists, traditionally uncomfortable with open displays of patriotism. But this discourse, which once promised much, has lost its original staying power, and Podemos is struggling to explain its position on Catalonia. Opposed to both unilateral secession and the suppression of Catalan self-government, all while calling for a legal referendum, the party is struggling to navigate the media soundbites. To Catalan nationalists, its position is equidistant in the face of oppression. 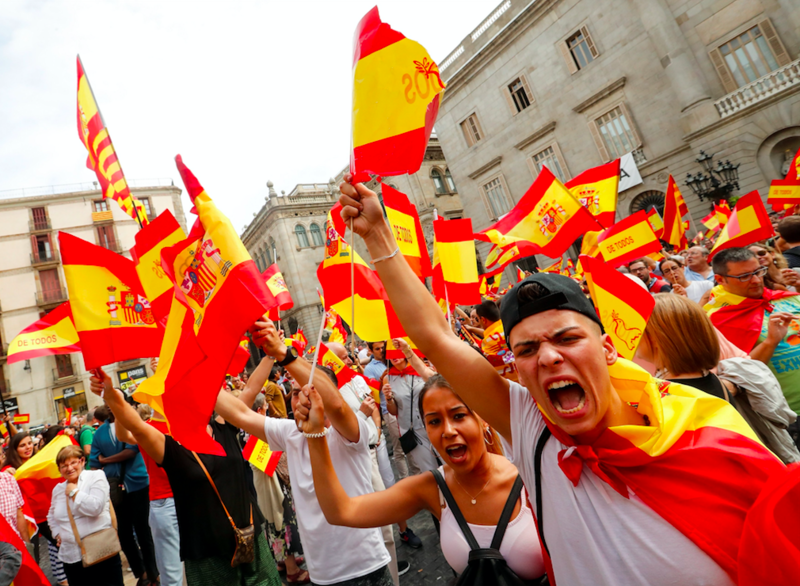 For the majority of Spaniards, it is as a concession to separatism. Podemos is paying the price for its role as the political force bridging the unionist-secessionist divide in a time of growing polarization. Right-wing pundits have taken to describing the party as “anti-Spain”—a moniker deployed under Francoism to portray leftists as agitators conspiring to destroy the country. Internally, Podemos has been undermined by a lack of coordination with its Catalan chapter and the Anticapitalista faction, which have embraced an accelerationism of sorts and occasionally aligned with the independence movement. Its spokespersons relied excessively on the positions of Barcelona mayor Ada Colau, who must perform a careful balancing act between socialists and center-left nationalists. And they were perceived as shying away from criticism of Catalonia’s government which, like the PP, holds responsibility for the escalation of the crisis and whose predilection for austerity and police brutality has been conveniently obscured by the 2012 turn toward independence. In a hostile media environment, these missteps have opened Podemos up to withering criticism. The party’s hesitancy has occasionally betrayed a lack of confidence in its own proposals. These may be difficult to achieve—reforming the constitution requires supermajorities and referendums—but they are more desirable and pragmatic than outright suppression of Catalan nationalism or unilateral separation. In spite of the present climate, a legal referendum remains popular, with a large majority of Spaniards supporting it in recent polls. Podemos has now recalibrated its position, disavowed its former Catalan leader and joined Catalunya en Comú, the leftist coalition modeled after Colau’s successful mayoral bid. However, with the right on the warpath, this was a bad time for the party to lose its nerve. Ultimately, the challenge is to present an emancipatory project for Catalonia and the entirety of Spain, and to do so at a time when the PSOE has given up on its fleeting leftward shift. The conjuncture seems dire, with the forces of reaction gaining ground by the day. But their agenda has little viability beyond the next electoral cycle. Spain is a plurinational and polycentric country. This reality cannot be repressed forever. It can, however, be the foundation of a new society—one that lies beyond the barren vision of Cánovas’ heirs.